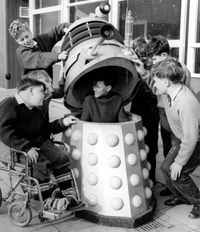 Children at the Warlies Dr. Barnardo’s home play with one of their Daleks. Following the success of the Daleks in the first few weeks of 1964, plans were already in motion by late February to bring them back to the screen. Three weeks later on March 17th 1964 Terry Nation was formally commissioned to write a sequel. The serial originally had working titles including “The Invaders” and “The Return of the Daleks”, but at the time it was being written, the ongoing future of the whole Doctor Who series was very much in doubt, with only one further four-part serial confirmed to follow the new Dalek story. 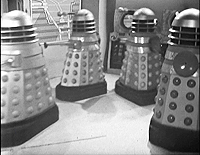 Terry Nation’s storyline called for an invasion force of Daleks, so the production team entered into discussions with Dr Barnardo’s to return Dalek Two and Dalek Four to the fold, and the construction of new props was budgeted. The use of the Dr Barnardo’s Daleks was agreed, and these became available for use from 12th August 1964. Two days after this date, the future of Doctor Who became more stable as producer Verity Lambert finally secured an extension to the series, taking it thirteen-weeks beyond the end of the Dalek sequel which was in pre-production. One man whose role in Dalek history is perhaps under-stated is Spencer Chapman. Chapman’s involvement with the Daleks had begun in 1963 when he had worked as assistant to Ray Cusick on the drawing board stage of The Dead Planet, having been brought in due to the workload1. A few months later, with Cusick occupied elsewhere, Chapman was the designer assigned to oversee the Daleks’ second serial. It was on his watch that we were first shown a Dalek Saucer, both inside and out, but more importantly it was collaboration between him and Shawcraft which resulted in one particular design alteration which would have a lasting legacy. If the props were to move effectively across various types of terrain during the planned location material then something other than small rubber castors would be needed. The outcome of this rethink was to fit a new, large fender beneath the existing one, which would add an additional 8 inches of height to the base. The Daleks had been originally designed by Ray Cusick to look compact, strange and barely large enough to carry a person inside, but suddenly they became large and imposing creatures. The striking image of a tall, solid metallic shape standing eye-to-eye with a human left a strong impression and, despite Cusick reversing this design change in future televisions stories, the “tall Dalek” was the one which reached the big screen, and it would be revived not once but twice when Doctor Who was reborn in the 21st century. The concept of a Dalek of equal height to a human was used in 2005 and the props were again given tall fenders as per Spencer Chapman’s design, and then this was taken to the extreme in 2010 with an even taller design that drew directly from the fender modifications made in The Dalek Invasion of Earth. Spencer Chapman’s other legacy is indirect. 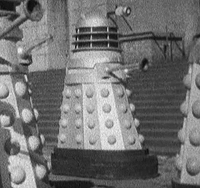 When the Daleks’ increased mobility had to be explained in The Dalek Invasion of Earth, it was decided a disc on their backs, (or more accurately, parabolic reflector with antenna) would explain how they received power2. Whilst this feature was not retained in future stories, Ray Cusick understood the need to acknowledge the issue, and he adapted the idea into the solar panels, or “slats” which would be added around the shoulders later. Ironically however, these slats would be removed from the 2010 Daleks, giving them even more in common with the props from 1964. Shawcraft took Dalek One and Dalek Three which had been held in storage, and set about refurbishing them and making improvements. The dishes were added to their backs which included a valve (or vacuum tube) in the centre. These varied in size from prop to prop. The new fenders, with their enlarged wheels, were also fitted. The new, longer eyes were given a reduced eye-disc configuration too. Instead of the original nine, tightly-packed sequence of discs, the new stalks were adorned with just five, but spaced further apart, providing a less-cluttered appearance. The ends of the stalks were given silver eyeballs of slightly differing design. 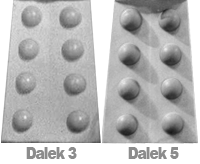 Dalek One‘s eye has a smooth transition from the ball part to the extrusion at the end, whereas Dalek Three‘s eye has a very distinct join between the spherical and cylindrical parts. 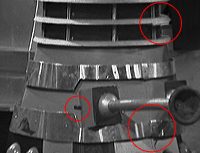 Dalek One had new screw-patches inside the gunbox which are quite noticeable in many scenes. Dalek Three had its upper collar straightened out after the damage it received in The Daleks, although the distress in the surface can still be seen. Its neck rings have also been repositioned and repaired after it came under attack from Ian Chesterton. Shawcraft were contracted to supply two brand new props4. Dalek Five and Dalek Six5 were built to almost exactly the same specifications as the originals, and using the same techniques – but nevertheless a number of interesting quirks arose via a combination of modification and renovation. There were two key differences between the original batch of four Shawcraft props and the new pair. The first difference was in their rear skirt panels. The original four props had their two columns of hemispheres positioned very near to the outside edges of the panel so the bottom hemispheres were quite far apart, whereas the two new Daleks had their lower hemispheres closer together at the bottom, so the columns were more upright. The second feature was that the shoulder sections had a slightly different internal construction of the gunboxes, which resulted in the screws on the outside surface being mounted higher than their forebears. Another outcome of this slight change in construction is that, when viewed from the front, the inward edges of the gunbox get closer together towards the top. The collars of the new props also looked noticeably more polished. The collar of Dalek Six is exceptionally shiny. As per the refurbished Dalek One and Dalek Three, the two new props were also provided with the new style of elongated eye-stalk, however theirs were slightly different. The eye-stalks for Dalek Five and Dalek Six were approximately an inch shorter than those of the revamped originals, and the eye-balls were more oval-shaped, as per those in The Dead Planet. As well as there being minor differences to the original props, the two new members of the family were also slightly different to each other. Dalek Five has slightly smaller holes for its arm socket, and its lower collar is snug to the front of the skirt.. Both new props had their hemispheres painted darker than the existing four props, however Dalek Five has even darker hemispheres than its partner. Dalek Six has a large blob of reflective silver paint on the inside of its arm-box, which is present in rehearsals and catches the light on occasion during studio recording, such as at the opening of episode two when it approaches the camera. This prop also has imperfections in its collars. The lower collar has a lift at the front, and a large over-hang above the skirt. Viewed on its left side, the upper and lower edges of its top collar are not parallel, and the collar tapers towards the front, resulting in no overlap on the top of the gunbox. Another difference between the two props can be seen in the positions of the hemispheres. 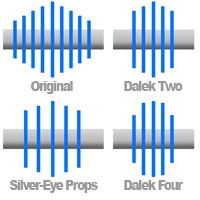 Dalek Five has a large gap between the lowest and second-lowest hemispheres on the rear-left corner. Dalek Six’s top right hemisphere on side panel L4 is sunk too low. The last two Daleks to join the party were those returned from Dr Barnardo’s, just over a week before filming stared in London. By July, both Daleks had made their way to the Stepney Causeway home and Richard Martin viewed them there and arranged to borrow them back. Daleks Two and Four arrived at the BBC in a sorry state after their six months in the care of Dr Barnardo’s. A variety of patch-ups meant that they both ended up sporting an accumulation of repairs, some of which had been done at the hands of Dr Barnardo’s themselves, and some hastily upon their return. Dalek Four also had much wear-and-tear to the gunboxes. The damaged veneer which can be seen in early Barnardo’s photos was still evident, as was the missing paint where a screw-patch had been torn off. With time being so short, the missing paint was never retouched, and it can be seen clearly on screen. This prop is also provided with a new neck cage with flat-top neck rods for this serial. Both Barnardo’s props had also lost their original lights and were therefore fitted with replacements, but they are noticeably different to the other four props mainly due to the lack of bulb-holders. The main characteristic shared by these two outcasts is that they were not graced with the new eye-stalk design prepared by Shawcraft for the other four props. Instead, both Barnardo’s Daleks are left with short eye-stalks as per their original appearance, and black eye-balls. Consequently they are not adorned with the new configuration of five wide-spaced eye-discs like their nicely-refurbished comrades, and instead they both have a half-hearted attempt to produce something similar. Dalek Two ended up left with just the middle five largest of the original nine discs, whereas Dalek Four had a totally bizarre set, featuring the two second-smallest discs at the outside, then two inappropriately large discs, and finally the largest in the centre. The fact that these rings are not sequential in size, combined with them still being bunched in their ‘tight’ configuration as per the previous serial, results in a very poor-looking appendage. Whilst there are more significant differences between the six props assembled for this story, the nature of the eye-stalks neatly illustrates that there were in essence three pairs of props: 1) The pair with long eye-stalks and silver eye-balls were those retained by the BBC from the last serial, 2) the pair with medium-length eye-stalks and silver eye-balls were newly built, and 3) the pair with short eye-stalks and black eye-balls were retrieved from Dr Barnardo’s. With Shawcraft having completed their refurbishment of the two stored props and the building of the two brand new props, a day of publicity was planned with these four matching silver-eye props. On the morning of Thursday 20th August, a team including Verity Lambert went out into London for a photo-shoot. Daleks were first photographed at Madame Tussauds, with the metallic aliens investigating waxworks including Queen Victoria. Next, a series of shots were taken of producer Verity Lambert and Dalek One inside the London Planetarium which is part of the same complex. Dalek Five and Dalek Six were photographed outside the Planetarium, including humorous shots of the Daleks ‘parked’ next to “no waiting” signs, with policemen dutifully attempting to deal with them. Finally, in the late morning, the props moved on to Westminster Bridge where they were photographed at the top of the steps with a number of children. Three days later, location work began on Sunday 23rd August 1964, again using the four Daleks that had been worked on by Shawcraft. The filming which took place around famous London landmarks in the early morning featured Daleks One, Three, Five and Six, including Westminster Bridge. Photographs were taken at all locations. “A BUZZER SOUNDS AND ALL THE DALEKS CEASE WORKING AND TURN TOWARD THE DOORWAY. A PAUSE, THEN THE DOOR SLIDES OPEN, AND A DALEK ENTERS. DIFFERENT TO THE OTHERS ONLY IN THAT HE HAS A DIFFERENT PAINT JOB. This is revised in later drafts so that the Dalek Supreme is introduced in episode two, leading operations inside the Dalek Saucer before transferring to the mine. The final version of the camera script shows all Daleks are ‘drones’ until the Dalek Supreme is revealed, however, no mention is made to any sort of “different paint job.” At some point during rehearsals it became clear that the Dalek Supreme should be distinct from the other drones and would need painting. 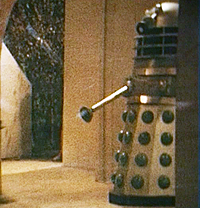 The Dalek nominated to be repainted was Dalek Two and the black paint which was applied conveniently masked some of the inadequacies of this prop’s battered appearance. The head, the front of the gunboxes, and alternate skirt panels were covered. It also suited the fact that this prop already had a black eye-ball. It is unclear whether the partial paint scheme was due to time constraints or a conscious design decision. For the iconic early scenes in which prisoners were lead to the saucer a camera was mounted high up in the studio (a favoured technique of director Richard Martin) affording an excellent view of the floor-plan. For these scenes, Dalek Five stands guard to the left of the saucer ramp, whilst Dalek Three is to the right. Dalek One stands in the centre waiting to greet the prisoners, whilst Dalek Six and Dalek Four lurk in the shadows. Then later, Dalek Two bursts in, with new paint scheme, and asserts his authority. Cardboard cutouts were also employed at the back of the set. Daleks One, Two, Three and Five carried the bulk of the scenes in this story, with Dalek Two as the Dalek Supreme having its paint job fully completed to all black by the following week, without any explanation. Dalek One is the guard in the mine workings which Barbara tricks into taking her to the Dalek control room. Dalek Two’s scratch repair. Click for a larger view. 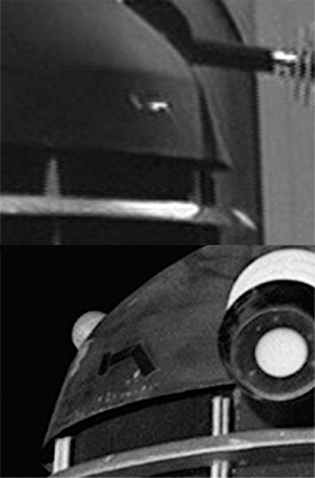 Soon after receiving its full black paint job, Dalek Two took some damage to its dome and a large scratch appeared revealing the silver beneath. This was quickly patched up with some black tape but due to the nature of the TV cameras in this period, the tape can barely be seen onscreen. Dalek Four has its fifteen seconds of fame in episode two where two close-ups demonstrate what a poor condition the prop was in. It is also the prop held aloft by the liberated humans in the final episode, for which it had its extra-large fender removed. Dalek Six was largely consigned to the background of many scenes, although aside from the opening it episode two, it is most notably the Dalek nearest the mine diagram on the wall. Naturally the Dalek props could be opened to allow access to the operators, but the head, neck and shoulders were fixed together which helped minimise the mixing up of the components. Generally the two halves of each prop were always paired correctly, however it didn’t prevent Dalek Three and Dalek Four from swapping skirts. The final episode revealed notable damage to Dalek Six has occurred. One eye-disc has become broken and the lower collar had become dented and misshapen. According to Spencer Chapman’s recollections in the Dalek Invasion of Earth DVD interview with him. The origin of the discs seems puzzling. Spencer Chapman talks about them as if he invented them to solve a plot hole in the story. And yet surely the Daleks’ dependency on static electricity would have been mentioned in Terry Nation’s own script? Did the script leave a blank space suggesting the designer come up with something to explain their increased mobility? Or was it never mentioned in the script and the dialogue between Hartnell and Russell added during rehearsals to address the new additions in the props’ design? It is not possible to say for sure that the length of the eye-stalks was increased because the Daleks were taller, but it was an otherwise completely arbitrary decision. The length of the eyes can be reasonably accurately extrapolated from photographic comparisons based on known measurements of other components of the props. Whilst a myth once persisted of an alleged prototype termed ‘SC1’ which was recycled into the second serial, thorough modern research has proven this to be false. The four props seen in The Dalekshave been conclusively shown to be reused into The Dalek Invasion of Earth, of that there is no question. These four props were all virtually identical to each other and aside from some minor differences in Dalek One, there was never any evidence to support that any prototype existed. There is one tale of a laughable assembly of household items which approximately resembled a Dalek shape which was used to demonstrate the rough idea – but this is a far cry from a ‘nearly Dalek’ which might have been usable on screen. 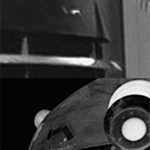 The two props which first arrive in The Dalek Invasion of Earth(Five and Six) appear brand new, robustly built and share with each other a host of new quirks. To suggest that either of these could have been the prototype would really be to suggest that there were two prototypes, since they share so much in common with each other, and have so many differences to the four props used in The Daleks. Publicity photos taken before filming show Five and Six are pristine props with absolutely no evidence that of them might have been an ancient reject prototype overhauled up for television. In fact, the one prop which does get singled out as the candidate prop for being ‘the prototype’ is neither of the new props. Unlike the designations of Daleks One to Four, our terms of ‘Five’ and ‘Six’ are not denoted by Shawcraft. We felt it reasonable that the prop which appears first, both on location and in studio, should be numbered first, and the other prop which is hardly visible in the story should be second. Also, Dalek Six has a visible patch on the arm-boxes, which from a quality perspective, puts it further down the pecking order. The Norwich photo shows that whilst Dalek Four was still in the hands of Barnardo’s it had clumsy modifications to the gunboxes. It also had lost the covering on the fender. This shows that changes took place before the prop was returned to the BBC. Furthermore, given the high standard of work at Shawcraft it is improbable that they were responsible for the highly-visible block attached to the middle neck ring. Even the BBC with the best of intentions would surely have been more visually conscious than this? It seems improbable that someone readying a prop for appearance on a television programme would do something so awful. The same might be said of the fixing which is stopping the arm-box from falling off. Dalek Two was given replacement collars which were not only badly-cut but incorrectly mounted. This metalwork is unlikely to have been done by Barnardo’s, and again the standard is below that of Shawcraft’s usual work. This leaves a big question mark over who did these poor-quality refurbishments. Logic would suggest that based on timing and a process of elimination, the bad refurbishments to Dalek Two and Four must have been done by the BBC. It would also explain why these two props retained black eye balls, if they weren’t in the care of Shawcraft as the other props were. But as the Doctor once said – Logic merely allows you to be wrong with authority, so therefore we have merely presented the facts of which we are certain, and hopefully phrased it in such a manner that the reader will draw the same conclusion we did. The only problem with this otherwise elegant theory is that of the modifications shared by all six props. It makes perfect sense that props Two and Four were handled by the BBC and therefore look worse than the others, but what doesn’t make sense is who provided and fitted the new large fenders and the dishes on their backs? If Shawcraft fitted the new fenders to all the props, then they must have had all six props at their workshops, which would mean that they saw the awful state of Daleks Two and Four and did nothing about it. Why were the eyes left in such a state? Why wasn’t the neck repair addressed? But what are the alternatives? Could the BBC have created and added the bigger fenders? Could Shawcraft have prepared the components and handed them over for the BBC to fit? None of these scenarios seem probable, so for now this remains a grey area that we have glossed over. It is not certain that Dalek Five received its darker hemis during location recording but it seems logical and there is evidence to support it. Photos of Daleks Five and Six before filming don’t show any difference between the props hemisphere colours. Photos of Dalek Five on the banks of the Thames seem to show the normal light blue and from the shadows and the sunrise times in 1963 it can be calculated that the photos were taken around two hours after sunrise. However the footage shot for the episode shows extremely dark hemispheres and again the shadows show this was roughly four hours later. Could it be that the bright sun was causing problems with the contrast? It seems feasible that a quick repaint allowed the Dalek to have its detail picked out better. They had several hours in the bright sun for the paint to dry. And once returned to studio, the hemispheres are noticeably darker for the remainder of the serial. 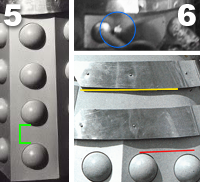 Dalek Five can be identified on location via its slanted gunboxes and the high screws on the interior of the gunboxes. It lacks the patches inside the gunboxes which Dalek Six had. 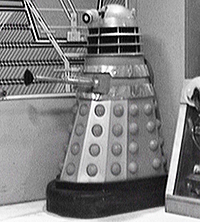 Once in studio, the prop for the continuation of the scene becomes Dalek Six, where its upper collar can be seen to lack parallel edges, and as it approaches the camera, the light glints off its silver paint patch which is later replaced by a neat patch. 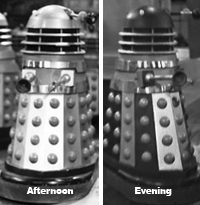 Rehearsal photographs clearly show Dalek Two with its distinctive neck repair still painted silver. We therefore know that the six props all arrived in studio looking the same. Furthermore, since rehearsals took place in the afternoon and recording took place in the evening, this proves that the painting of this prop was done by the BBC in studio in the late afternoon.